Warm, strong, authoritative tone infused with humor. Radio & Television, eLearning, Corporate Videos, Audio Described Tours, Audiobooks, Documentary Narration, and more. 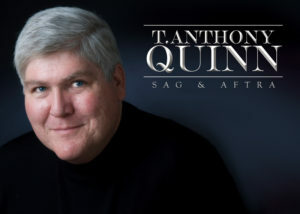 T. Anthony Quinn is a classically trained actor and has been a courtroom attorney. T. Anthony Quinn specializes in audio narration. His preferred file delivery method is Dropbox, but he can use Box or WeTransfer or whatever FTP you choose. We can conduct real-time sessions through Source-Connect. In his home studio, T. Anthony Quinn uses either a Rode or an Audio-Technica microphone, depending on the desired sound. Demos and conflicts available upon request.